The rustic flavors of pumpkin and cinnamon shine through in this moderately sweet flan, while the salted pumpkin seeds added as garnish provide the perfect crunchy contrast. The degree of sweetness is easily controlled by the amount of syrup drizzled over each portion at serving time. Turn your oven on to 350ºF/175ºC so that it can pre-heat while you do the rest. Make the mix: Pour both cans of milk—sweetened condensed and evaporated—into a blender container. Add the pumpkin puree, the eggs, and the cinnamon. Blend for about 30 seconds. Pour this mixture into the prepared custard dishes or round baking dish. Set up the hot water bath (bain marie): Place the filled dish(es) into a larger metal baking pan and place in pre-heated oven. Add enough warm water to the metal pan to come within about an inch of filling it completely. The warm water should surround the glass dish(es) in the pan. Bake your flan for about 40 minutes, until the edges are firm but the center still looks a little jiggly. Carefully remove the dish(es) of flan from the oven and from the hot water bath. Discard the water. Allow your flan to sit until it cools to room temperature, then refrigerate for at least 4 hours or overnight. To unmold flan, use a table knife to gently pull back or cut around the edge of the flan so that the custard is separated from the dish. Place a plate on top of the dish, then quickly invert both dish and plate so that the flan slides out of the dish and onto the plate. If you’ve made one large flan, cut it into wedges. 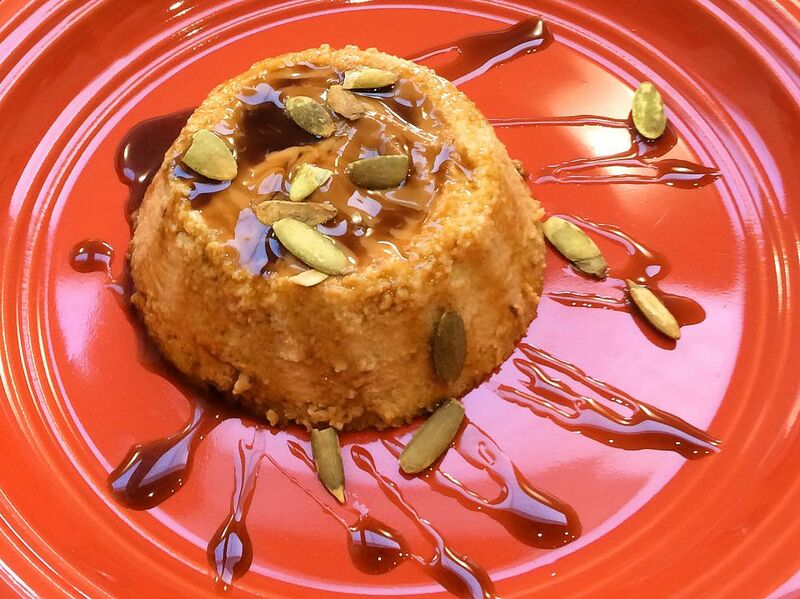 Serve each portion of your delicious pumpkin flan with a drizzle of the reserved dulce de leche or syrup and a sprinkle of salted pumpkin seeds. *Buy commercially-produced dulce de leche or piloncillo syrup in a squeezable container at your supermarket, or make your own syrup by slowly dissolving about a pound of solid piloncillo in a cup of hot water over medium-low heat (stirring occasionally). For even more rustic charm and texture contrast, toast your pumpkin seed kernels before using them in this recipe. Use both dulce de leche and piloncillo syrup—the former in the bottom of the baking dish(es) (before pouring in the custard mix), the latter for drizzling at serving time. Served with whipped cream or a fluffy dessert topping as well, sprinkling a few of the pumpkin seeds on top.